Petroglyph and pictograph sites have been recorded all over the world, but the North American continent is home to one of the most diverse and culturally significant bodies of paintings and engravings to be found anywhere. Warren Upham, a geologist and librarian who traveled extensively throughout Minnesota in the 1880s, was the earliest American of European descent to document the existence of the site. Newton H. Winchell summarized his description in the first comprehensive geological survey of the state in 1884. Between 1880 and 1895, Theodore Hayes Lewis documented burial mounds and other aboriginal earthworks in Minnesota and Wisconsin. He compiled the first known documentation of the individual carvings at Jeffers. For about 50 years after Lewis’s visit, little scholarly interest was expressed in the petroglyphs, though graffiti from the era proves that local farmers and townspeople were aware of the site’s existence. In 1941, Lloyd A. Wilford, a University of Minnesota archaeologist, visited the site, but his notes from the site reflect that he was more interested in glacial striations on the rock face than the petroglyphs. He did point out the extensive lichen growth on the rock outcrop, which also explains why he noted only “several” petroglyphs being visible. The cyclical growth of lichen most likely affected the petroglyphs’ visibility at any given point in time, and may be one reason for the erratic documentation at the site. Paul Klammer, a local photographer and member of the Minnesota Archaeological Society, also visited the site in 1941. Klammer took a series of black-and-white photographs of the carvings. Throughout the 1950s, local residents near Jeffers, including county historical societies, urged the Minnesota Historical Society to purchase the petroglyph site for preservation and interpretation. In 1966, MNHS purchased 40 acres of land from the Warren Jeffers estate that included the main rock outcrop at the site, and the historic site was opened to the public. A local resident, Florence Roefer, served as the “custodian” of the site, and a small structure was built as an interpretive center. During this period, the carvings were painted with a marine varnish to increase their visibility for visitors. This practice continued until the early 1980s, and traces of the varnish can still be seen on some parts of the rock face today. In 1971, MNHS dispatched archaeologist Gordon A. Lothson to Jeffers with instructions to document as many carvings as possible. Lothson discovered there were many more carvings than previously estimated and the project, originally planned for two weeks, extended into two months. Two anthropology students and an artist assisted in the effort. They identified approximately 2,000 individual petroglyphs on a part of the rock face 50 yards wide and 300 yards long. The petroglyphs contained images of humans, animals, tools, and unidentifiable shapes carved by ancient Native Americans. The glyphs are not evenly distributed over the exposed surface, and appear to reflect episodic use of the site over as long a period as 7,000 years. Lothson documented the carvings in three different formats: photographs, rubbings, and line drawings. In 1976, Lothson published his research and interpretation of the site. It was the first introduction that the general public had to the site. In his publication, Lothson set forth his view that many of the almost 2,000 carvings he had documented were related to the performance of sacred ceremonies and the recording of important events among these ancient peoples. In 1999, MNHS secured state funding for a new research project led by Robert Clouse, head of the Archaeology Department at the University of Minnesota. Clouse conducted a summer field school at Jeffers, where students worked on a new effort to document the carvings, influenced by contemporary rock art theory that rejected the practice of researchers interpreting the carvings when documenting. Clouse developed a new technique for recording carvings which, he believed, would eliminate observer bias from the process. 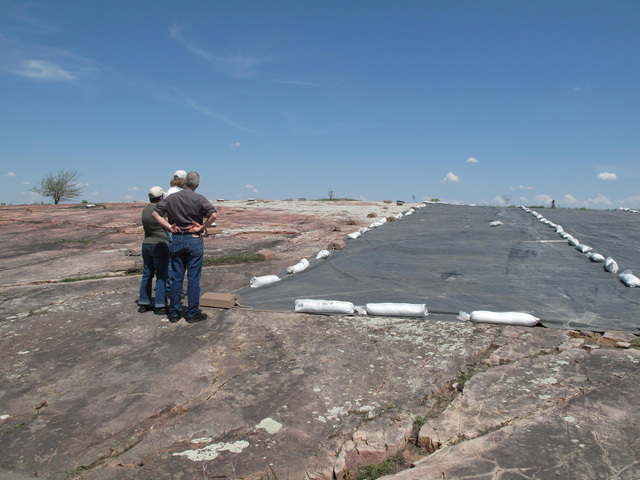 Students placed sheets of mylar on the rock face and using colored markers, recorded not shapes, but individual peck marks. Adjacent to this main rock outcrop was another wide, flat rock slab. This one was covered with lichen, an organism that is part algae and part fungus that anchors itself to the rock. Because of the lichen, researchers were uncertain whether there were additional engravings on that rock, and if there were, what they would show. Removing the lichen would have to be done carefully so as not to damage any potential petroglyphs that lay beneath. In 2006, Tom Sanders, the site manager at Jeffers at that time, initiated a new conservation and documentation effort to address long-term conservation issues. He assembled an interdisciplinary team that included Native American elders, conservators, archaeologists, and MNHS staff. Several years of discussion, experimentation, and consultation resulted in the Jeffers Conservation Project. The project included a plan to naturally remove the lichen in a way that would have the smallest impact possible on the petroglyphs that might be underneath. The effort took more than five summer seasons and included covering the lichen with sun-blocking black plastic membranes to remove their source food via sunlight, and removing dead lichens with careful and repetitive mopping. The effort paid off, with researchers uncovering around 3,000 additional petroglyphs on the site. This more than doubled the number of identified carvings at Jeffers Petroglyphs, from 2,000 to 5,000. The new discoveries also provided evidence that generations of Native American ancestors who gathered at the red rock for nearly 7,000 years had advanced understanding of mathematics, geometry, astronomy, and medicine. Details about the Jeffers Conservation Project are now published on a dedicated website. Jeffers Petroglyphs: a Recording of 7000 Years of North American History (PDF) by Tom Sanders, April 2014. Native American elders have participated in the conservation and the ongoing interpretation of the petroglyphs’ meaning and significance. Over time, a research team assembled at Jeffers Petroglyphs to further the understanding of the people who interacted with the carvings, their history and culture, and the meanings of the carvings. Members were made up of Dakota, Arapahoe, and Cheyenne elders, state and university archaeologists, and conservationists. They spent many years increasing today’s understanding of the carvings and the ancient people who came here. These carvings are not just physical symbols but hold meaning as the ancient carvers’ visions, prayers, and messages. Elders have played a role in elevating Jeffers to the living sacred site it is, sharing stories that reinforce the spirit of historical wisdom passed on to the young. In 2011, the Minnesota Historical Society contracted with the University of Minnesota’s Evolutionary Anthropology Lab to scan a portion of the petroglyphs using zero impact white light. The resulting 3D images form a unique collection that helps preserve the story of the petroglyphs. Legacy funds allowed staff to catalog the 2,117 images and make them accessible as master digital files at the historic site and in MNHS's Collections Online. The Jeffers Conservation Project website provides information about the history of the petroglyphs and the various ways they've been interpreted and documented over the years. The images of individual carvings will serve as an archival record, a research and conservation resource, and an educational tool. Learn more about the MNHS archaeology collection.